Lots of colour, lots of love and a quirky bride who is sure to steal your heart! Varun and Vasundra’s wedding held at Hotel Bristol, Gurgaon is just what we needed to see on this mid-monsoon-dull-rainy day! Focusing all their energy into making their wedding one-of-a-kind special without the pomp, extravagance and OTT elements that come with extra expenditure, this duo had a wedding on their mind which was comprised of close friends and family, with the perfect amounts of love and laughter – and that’s exactly they got! 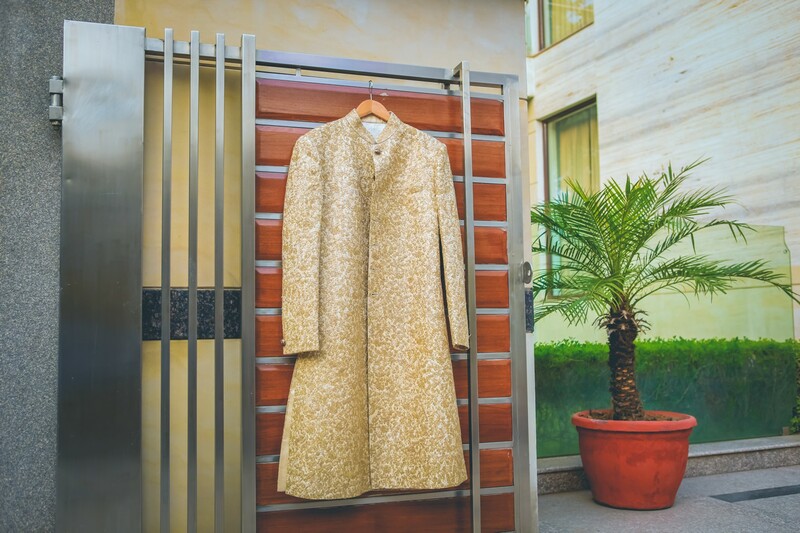 All of their pre-wedding functions were held at Hotel Bristol, Gurgaon which was the same location as the wedding itself (a great way to do it if you wanna stay away from the extra messiness of logistics and planning!) Hotel Bristol, Gurgaon was transformed into a beautiful wedding venue with the help of local decorators and Vasundra herself! With lots of Pinterest research, personal touches and one too many cups of coffee, this bride whipped up her wedding décor that left us spellbound! Now, isn’t that what weddings are all about. Personalization is key, like we always say and this bride did it just right! The dancing, the warm hugs and the marigold flower-shower: this was one mehndi ceremony we would love to be at! Vasundra looked stunning in a turquoise sharara paired with a pink choli and a beautifully scalloped orange dupatta. This mehndi outfit proved to be a perfect pick for her outdoor mehndi ceremony filled with loads of colour. 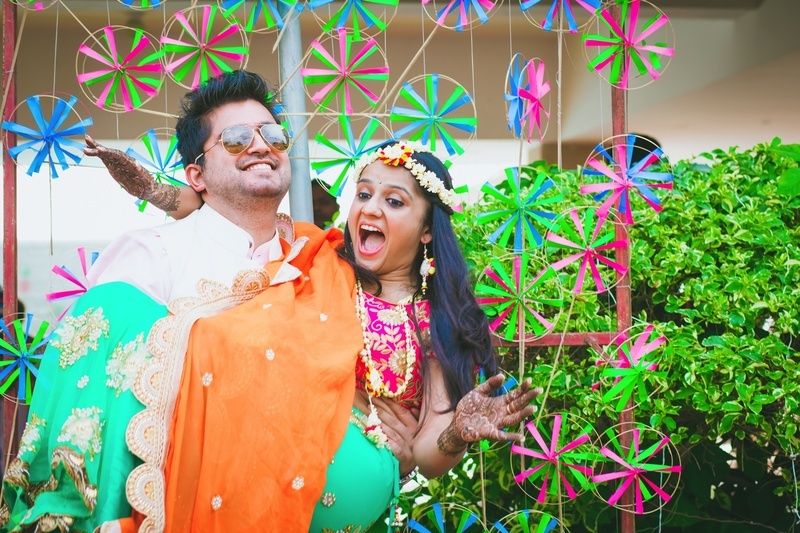 What we especially adore about Vasundra’s outdoor mehndi ceremony was how DIY-easy her décor was! The pinwheel photo booth backdrop as well as the triangular flags – so beautifully ideated and executed too. Vasundra and Varun were now ready for round two at their Indian wedding celebration – that’s right, the engagement ceremony! - held at Hotel Bristol, Gurgaon, they combined their sangeet and engagement ceremony for one night full of dancing, love and happiness. Vasundra wore an aqua blue lehenga with a pastel pink dupatta styled with diamond earrings and necklace while Varun’s sherwani played a perfect contrast in a hue of navy blue. This off-beat bride picked pink. A shade of pink that was an ideal choice for her swagger-self! All gota work pink lehenga-choli paired with a contrasting teal net dupatta from Asiana Couture, Delhi, was a smart outfit choice for their evening wedding at Hotel Bristol, Gurgaon. Varun’s entry on a bike instead of a ghodi, the kaleere dangling bridal chaddar and those secret looks this couple stole of each other – everything about this wedding was picture perfect!